Configurable plugin based on your business accounting needs. Automatic email alerts for any discrepancy in order. No plugin Update required when New version of Zoho API released. Provide Online Support via email and skype. We are supporting these nopcommerce versions 3.8,3.9,4.0,4.10. Cloud plan allows your business to grow hassle free. In this plan, you will be charged based on the usage of orders. You will be charged at end of the month based on the number of successfully synchronized paid orders. Open Connector Website (https://connector.satvasolutions.com), if you do not have account then register your account, and if you already registered then login into connector site, and go to Settings -> My Subscription -> Click on Plan Button and provide Email id and Credit Card number, and subscribe with the plan. First, you need to download the nopCommerce API plugin for your version of nopCommerce. After download plugin, install and configure the plugin in your nopCommerce site, as per below instruction. Login with admin credentials in nopCommerce, Goto Admin panel, open local plugin list. If you are using nopCommerce version 3.80 and 3.90 then install the manual plugin as per the below steps. Upload the plugin to the /plugins folder in your nopCommerce directory. Restart your application (or click 'Reload list of plugins' button). Click on the 'Install' link to install the plugin. If you are using the latest version of nopCommerce Plugin 4.00 and 4.10 then there is a button that is available for upload plugin and theme. 5. After uploading refresh the plugin list and click on the install button. 7. Under API click on the “client” menu and configure API. 5.2 - ClientId and ClientSecret both are auto-generated. After that click on Save configured settings. Open to above Website URL in your browser. If you have already registered on Zoho then Login with a valid credential into the Connector website. If not registered then please register on the connector website. Goto Settings on the left side navigation menu. Select Cloud Plan and Subscribe with Stripe. After successful subscription with stripe, the user automatically navigates to plan list and show the plan detail like plan name, the status of the plan, previous billing date, next billing date, current month usage like the number of order sync with Zoho books and cancel subscription link option. Goto Settings on the left side navigation menu and select Connection from Menu and Select Connection. Click on Add button on the right-hand side, for add new connection and select connection from connection nopCommerce and to connection Zoho books. Click on Connect for a new connection. Now configure a selected connection. Click on Connect Link under From Status and configure nopCommerce API plugin detail. Site URL : nopCommerce Site URL. Click on the Connect button, if all details are correct then connection establish with from channel (nopCommerce site). Now Connect configure To Status (Zoho books), click on Connect button under the To Status and before click on generate token button need to sign in Zoho books account and then click on generate token button, in-browser new tab open for generating Authtoken page, click on Generate Authtoken button and copy the token keys and paste in connector access token textbox. Paste auth token into the Connector website access token textbox. After setup all, click on the Connect button. If From channel (nopCommerce) and To Channel (Zoho books) are configured properly then after configuring Zoho books organization and chart of accounts. Here you configure Your all chart of account and tax information details, so according to your configuration record, you will sync with Zoho books. tooltips are available for more help. In the second tab is used for sync configure based on the ON-OFF button. Click on the save button for save configuration information. and On the connection using the on/off button. After the Successful installation and Configuration Go to Sync Log from the left navigation menu. And click on download button select your connection and log type as order it will sync contact, item, and order, at the time of sync process. After clicking the download in a few minutes orders are download from nopCommerce and sync with the Zoho book, and all the details of sync process display in sync log page as per below screenshot. If any error occurred then it will display an error message in the notes column. Q. What is Cloud plan? Q. How much does the cloud plan cost on monthly basis? The cloud plan has no fixed monthly bill. It costs based on usage per month. You will be billed on monthly basis automatically. First 50 Orders are free. From 51 to 2000 you will be charged $ 0.02 Per Order. Q. How to Subscribe with Cloud Plan? Open Connector Website (https://connector.satvasolutions.com), if you do not register then register your account, and if you already register then login into connector site, and go to Settings -> My Subscription -> Click on Plan Button and provide Email id and Credit Card number, and subscribe with the plan. Q. How To Configure Nop Plugin? Q. 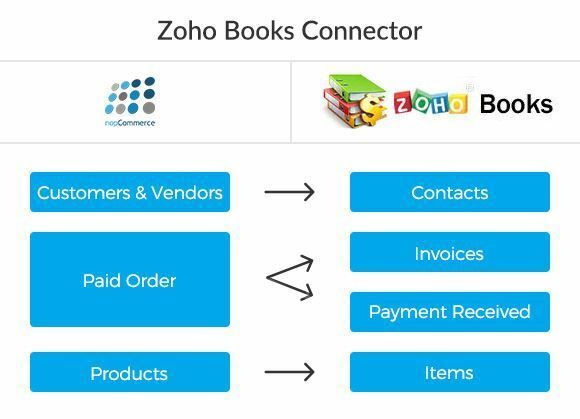 How to Sync Orders between nopCommerce to ZohoBooks? All successful configuration of connection, sync will work two ways one is automatically and another one manual, for automatically our service sync your record with Zoho book in background process it will run on particular time interval, and for manual sync click on Sync log on left side menu, click on download button select your connection and log type as “order” click on download button, after that it will start download order from nopCommerce site and sync with Zoho books, you can check logs and log history in sync log page, also if any error occurs during sync then it will show in notes column. Q. If any Order, not Sync due to the Internet or any other error, Can we Sync again? Yes, you can sync again that particular order using reprocess order, go to sync log page from left navigation menu, click on “Show” Link of particular failed record, it will show sync history and at the end of popup button called “Retry Upload” click on button it will reprocess your order again. If you want to multiple order failed and sync then the checkbox is given before log status select failed orders and click on the Re-Process link is given on top of the data display grid. It will change status to download and sync automatically. Q: How do I know if any error occurred during order processing? System will send detailed email of your failure orders during sync process in every day. Q: How can I contact the support, team? User can contact support team via skype and email, support team provide you support online via skype also you can drop an email to support team regarding any complain or issue.